Without a longer battery life in the laptop, and less noise while docked, the GS30s impressive gaming performance isnt quite enough to make it a must have. MSI’s innovative GS30 2M Shadow is a laptop setup that strives to be both thin ‘n’ light laptop as well as a fully-fledged gaming desktop machine, all in one smart package. And it so very nearly gets it all right. In some areas it falls short of our expectations, but MSI is still the only company to have actually managed to get a laptop with an external desktop graphics card into the market so far. Ever since I started professionally testing technology in the mid-naughties, companies have been excitedly showing off their different takes on external graphics card adapters for laptops. The one thing they’ve all had in common? They never really made it far from the prototype stages. It’s like some sort of PC alchemical holy grail—making graphical gold from the leaden performance of a normal laptop. 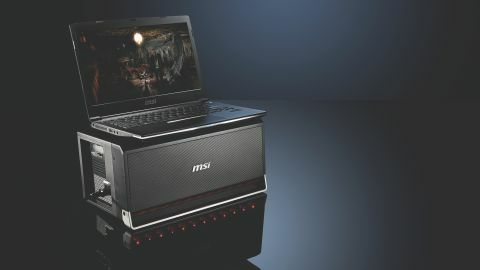 But MSI’s GS30, with it’s Gaming Dock, is the first to actually deliver on the promise of using a normal desktop graphics card bolstering a thin ‘n’ light, non-gaming notebook. The two-pronged attack of this pricey package has a lovely-looking, seriously light, 13-inch laptop in one corner and a rather ugly black box packing a 450W PSU and mighty MSI GTX 980 graphics card in the other. To get them to play nice together you simply lay the GS30 atop the Gaming Dock, pull a lever and the whole thing is then powered by the desktop power supply inside. You might as well close the laptop’s lid too, as all the video is taken care of by the GTX 980; you’ll then need to plug a monitor into the GPU’s output. But you’ll also want to plug a keyboard and mouse into the USB 3.0 hub in the Dock, where you’ll find a pair of stereo speakers, too. You can even jam some SATA storage inside it to house the part of your Steam library you’re not going to be able to play on the go using the Iris Pro graphics in the laptop. And it works almost seamlessly. Apart from having to shutdown in order to plug in or undock, you can switch between thin ‘n’ light laptop to gaming desktop in a trice. You’re not sacrificing any GPU performance either, as the dock’s connection to the notebook is a full x16 lane PCIe 3.0 socket. Alienware’s similar Gaming Amplifier is only using a GPU-hobbling x4 connection. And, while that is still going to improve upon the gaming performance of the Alienware 13 laptop itself, you’ll know deep down inside that you’re wasting valuable frames per second of whatever desktop graphics card you’ve plugged into it. Sadly, with the GS30 it’s not as simple as just plug, play, and be happy. It’s never that simple. Even though the gaming performance is right up there with a powerful desktop machine, the experience isn't. Even though the gaming performance is right up there with a powerful desktop machine, the experience isn’t. MSI has rightly opted for the top mobile i7 CPU in order for the processor to outlast the graphics card in the dock—there would be no point upgrading the GPU if the notebook’s CPU could no longer keep up. It’s a beefy quad-core, octo-thread processor of Intel Haswell ilk running between 2.8GHz and 3.5GHz in this setup. There’s also a huge 16GB of DDR3 memory inside that little package too, helping drive the future-proofing angle home. Unfortunately neither the cooling nor the battery in this svelte laptop can cope with such a powerful chip running in this thin form factor. The fans are regularly spinning loudly, whether docked or no, and the 4-cell battery life away from the plug is a ridiculously short 82mins of HD video viewing. That's not even long enough for a full movie. Which is a massive shame, because I would otherwise be chasing down a GS30 myself, desktop graphics or no. With the CPU and Iris Pro graphics it’s a powerful little thing in its own right. So, if the ultrabookish laptop is a mite disappointing, what of the Gaming Dock? Well, that side of things is definitely impressive, though still feels a little first-gen. The design is functional and not much more. It’s simply a box with a GPU and PSU inside it and a PCIe connection on top. MSI tried to boost the geek appeal by adding some LEDs, but it’s certainly not particularly aesthetically-pleasing. With the GS30 perched on top it feels a little jury-rigged, but I’m really excited to see what MSI can do with a second-gen version. I’m hoping for a sleeker design where the closed laptop slips inside rather than rests atop. I just hope we do get a second-gen version. At the outset in the UK you’re forced to buy the GS30 with a GTX 980 bundled, which is why it’s such a huge price at £2,200. You will, however, eventually be able to an empty gaming dock and fill it with whatever MSI GPU you wish. I have learned Scan.co.uk has ordered a bunch of barebones units for this express purpose. In the US there are no such problems, where Newegg is already selling the barebones bundle for a more reasonable $1,900. But should you buy one? Unfortunately I’d have to say no, and that’s because there are better options out there already if you’re chasing a desktop replacement laptop. It’s all about the fantastic Asus G751JY for me, which we recently picked as the best gaming laptop. The 17.3-inch gaming behemoth comes with the mobile version of Nvidia’s top GPU. It's actually cheaper than the GS30 and the add-on cost of a GTX 980, and you’re then getting around 75% the performance of the desktop card, but a better overall experience. Of course it is much bigger than the GS30 when it’s in laptop mode, but because you’re taking the GPU with you proper gaming on the go is a possibility. And with its 8 cell battery you do actually get better battery life than the Iris Pro-powered MSI notebook. You can even ‘dock’ the G751JY on your desk, too. It’s not quite the same deal as the bespoke gaming dock, but plug a keyboard, mouse and 1440p screen into the Asus and you’ll have a great gaming experience. It will be quieter, too, thanks to the chunky chassis’ impressive cooling. The only issue there is that you’re not going to be able to upgrade the Asus GPU, but the performance on offer is going to last you a good few years anyway. So, it’s a no-cigar moment for MSI’s GS30 by comparison. Technologically the idea of the wee machine and its docked graphics card is sound and rather appealing, but the laptop component needs a lifespan capable of seeing you through a day at college/work then let you game without an aural assault when you get home to Dock. It’s not a complete bust by any means, but it’s not something I could recommend right now - I just hope MSI don’t give up because a second gen version could be something really special. All our tests were carried out at the highest settings with 4x anti-aliasing applied.